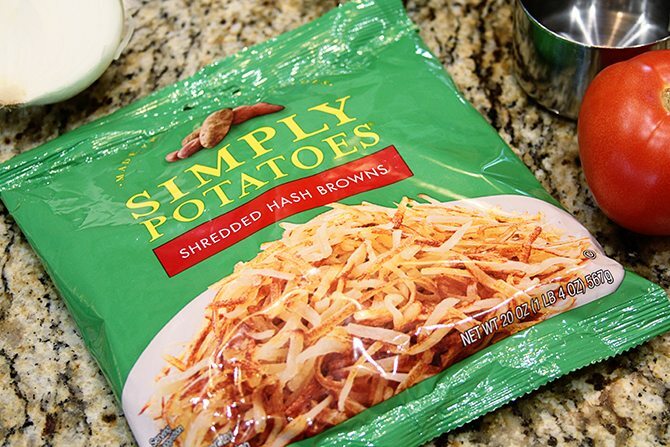 Simply Potatoes makes brunch easy because you get the flavor and texture of fresh potatoes without all the work. No peeling, no washing, no shredding. 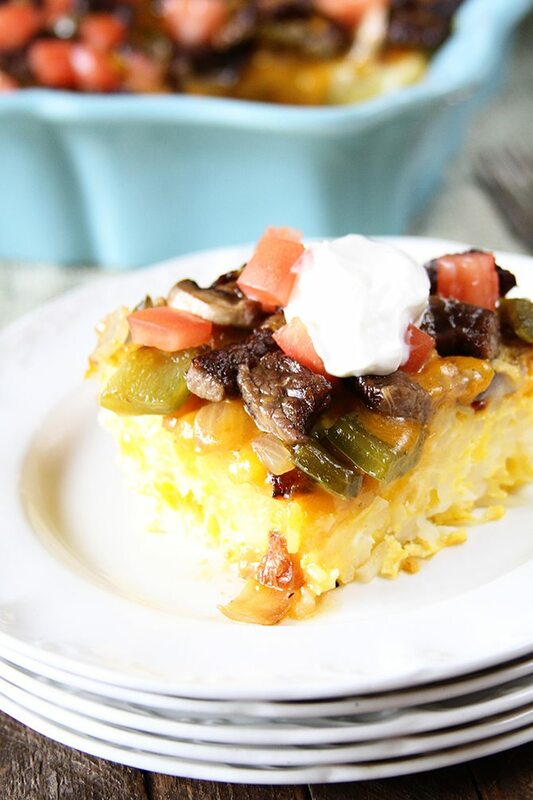 That makes them perfect for this Baked Big Steak Omelet. It has all the great flavor of the restaurant favorite with a lot less work. It’s SO much easier. This is my wife’s favorite brunch/breakfast entree when we go out, so I just had to create it at home. And it’s surprisingly easy. With family -friendly flavors, it’s perfect for your next family gathering too. Easy and tasty? That’s a win-win in my book! Don’t be intimidated by the ingredient list or the instructions. The steps are super easy. Read through it one time and you’ll see what I mean. Y’all enjoy! 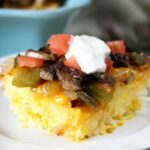 My friends at Simply Potatoes are going to give one lucky Southern Bite reader a beautiful 9.5-inch Le Creuset Baking Dish! Be sure to see the entry box below the recipe for your chance to win! Preheat the oven to 425° F. Lightly spray an 8x8 baking dish with nonstick cooking spray. Pour the hash browns, melted butter, and salt into the dish and stir to combine. 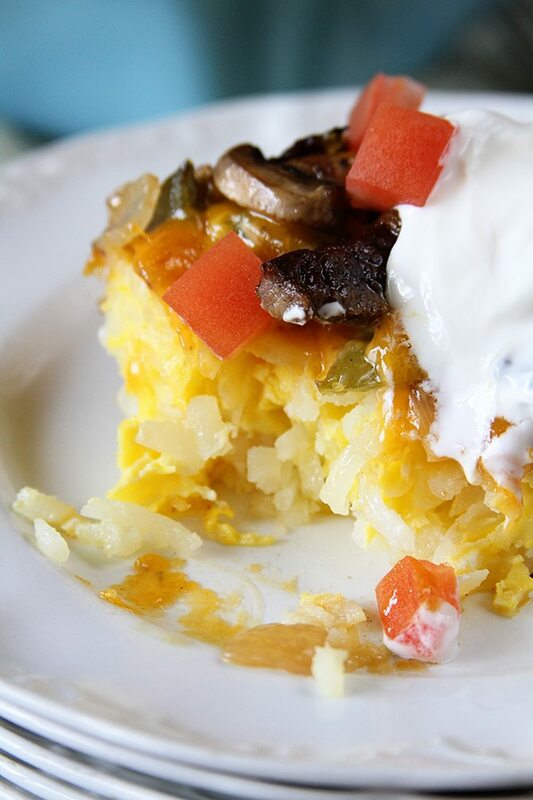 Lightly press the hash browns evenly into the bottom of the pan and bake uncovered for 20 minutes. While the hash browns cook, heat a skillet over medium heat. Add the oil. Once the oil is hot, add the chopped bell pepper, and onion. Cook 5 to 8 minutes or until the onions are translucent and just starting to brown. Add the mushrooms and cook until the mushrooms start to brown. Remove the vegetables from the skillet and set aside. Increase the heat to medium-high. Put the sliced sirloin in the skillet and season generously with salt and pepper. Cook about 3 minutes or just until the outside starts to brown. Don't overcook. Remove from the heat and set aside. Once the hash browns have cooked, remove the dish from the oven. Decrease the oven temperature to 350° F. Crack the eggs in a small bowl and whisk to scramble. Pour the eggs evenly over the hash browns. Sprinkle the cheese over the hash browns. Top with the steak, peppers, onions, and mushrooms. Be sure to discard any liquid that may have collected in the bowl from the steak or vegetables. Return to the oven for 25 minutes. Allow the dish to rest for about 10 minutes before slicing and serving. Serve topped with diced tomato and a dollop of sour cream. This looks delicious! I have one steak left in the freezer and have been wondering how I could make dinner for two with one steak. Now I know! I loved your video with Southern Plate and The Country Cook. Y’all had too much fun! Now you know!! Hope you’ll enjoy! I do believe I will love this! I sure hope you will!! Stacey, omg I think you’ve outdone yourself with this recipe! my mouth is watering just thinking about it…. it looks so good! I want to be a morning person, but I just can’t do it! Looks deelish, but I think I’d like a runny egg over this. TY. 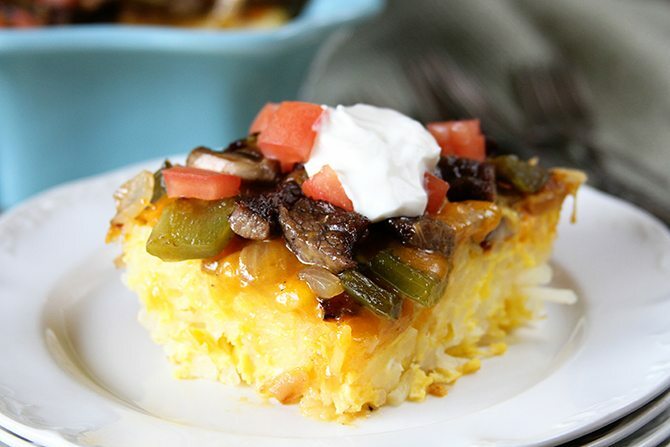 Could I make this as an “overnight” casserole type dish if I precook the steak and assemble it as a strata?